Patient lifts - for reliable, safe, easy-to-use mobility! For transfer from the bed, wheelchair, bath, commode, whirlpool...just about anywhere throughout the home or facility, a Barrier Free Lift/Horcher lift is your solution. Choose form a variety of ceiling-mounted, wall-mounted or free-standing lift products as well as rolling lift products to provide reliable, safe, easy-to-use patient transfers and mobility! These lifts may have the "Barrier Free Lifts" or Horcher Lifting Systems or Horcher Medical Systems labeling/logo, as Horcher GmbH is the original manufacturer of Barrier Free Lifts-branded products. IMAGE Management, LLC provides sales/rental/lease of new and used lifts and service parts; used equipment purchase; as well as demonstration, planning, installation, service and support for these lifts. We have been providing these lifts, accessories for these lifts (slings, hand controls, batteries, etc.) and service parts for over 25 years. We also rent lifts for situations when the lift will most likely be needed for only a short time or when a lower initial payment followed by a monthly payment is desired. For more information about rentals, visit our Rentals page. Keep reading for more about patient lifts and/or contact us to discuss. Purchasing a Patient Lift for Home Use - finances, etc. Ceiling - Ceiling lifts run on "tracks" either (1) installed in the ceiling of your home/facility or (2) mounted on free-standing legs. They are the most versatile, convenient and least obtrusive types of lifts. Within the ceiling lift class of lift, there are installed lifts and portable lifts, which can be used in multiple locations. Track installations can be as simple as a six foot piece of track over the patient's bed and wheelchair area. Creative track installations can give the patient access to any part of their home or a facility. Patient moves freely on the ceiling lift track with little, if any, exertion. Powered movement on the track is available. Ceiling lifts do not take up floor space and do not require turning space. No need to move furniture. Ceiling lifts can pass through narrow passageways and around corners. Ceiling lifts are out of the way when not in use. When you're not using your ceiling lift, the lift can be powered to an out-of-the way location. Only the unobtrusive track is then visible to your guests. Ceiling lifts do not have "legs" so they can go over things a rolling lift can't, such as tubs, beds without under-bed space, recliners, etc. Floor (Rolling) - Floor model lifts roll on casters and are designed to perform different functions. These lifts use industrial casters to facilitate rolling on uneven surfaces. Multiple types of floor model lifts are available for special applications -- sit-to-stand lifts, lifts with a swiveling mast that can "parallel park" and anchor next to a tub or bed, etc. Features to look for: superior lifting height, leg spreading features, multiple models to handle different patient weights and/or assist with positioning the patient. Whether you choose a ceiling or floor lift, the patient will be lifted in a sling attached to the lift. There are many different slings available and slings come in multiple sizes and materials to support all patient care applications -- transferring while clothed, bathing, toileting, etc. We'll help you determine the proper style and size of sling. Ceiling lifts travel from point-to-point or room-to-room on a track installed in your ceiling. The track can be as short as a 6 foot piece of track over the bed and wheelchair area or as involved as track all over a home or facility. This track can be straight or curved and can have a variety of accessories (such as track switches, carousels, etc.) to help your patient get where they need to within your home or facility. Most lifts have a hand control to control the lift movement. Depending on the lift model, the hand control may have two, four or six buttons and may be electric or air control. These hand controls are sturdy but can be damaged. Almost all of the lifts we work with are battery-powered so there are battery packs and charging systems for each lift. These battery packs and charging systems are rugged but batteries will need to be replaced at some interval. Battery life can be extended with proper handling and continuous charging. 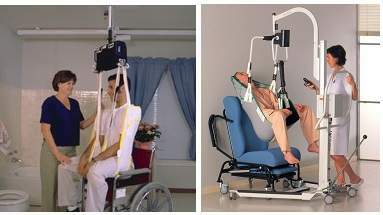 Ceiling lifts have a lifting strap that lowers and retracts back into the lift as the patient is raised and lowered. These straps are sturdy but can fray if the operator does not position the lift directly above the patient. Lift scales are a popular patient lift accessories. Many patients need to be weighed daily or at some other interval to ensure they have not gained/lost weight. Having a scale in the lift ensures easy and accurate weighing of the patient. Image Management, LLC has been installing lifts and providing lift service for over 25 years. If you are having trouble with your lift, contact us and we'd be glad to chat with you about and perform some preliminary troubleshooting of your issue over the phone. We provide onsite service in our geography and we provide depot service for any other area of the country. If we are providing service for your lift and if you have no backup lift, we also have some loaner lifts that we can let you rent while we are performing the repair. We also sell lift service parts of all types for service providers and mechanically-inclined lift owners. Contact us to let us know what part you need and we will get you a quote. Preventing caregiver injury is a driving force in the purchase/use of patient lifts. Even highly skilled facility caregivers can injure themselves by overexertion and strain. While the use of manual (hydraulic) lifts is a step in the direction of caregiver safety, they still require caregiver exertion. Power-assisted patient lifts are the answer to preventing caregiver injury. Evaluating a new product is a daunting task. Rest assured that there is a patient lift solution for you. Before you go further, use these questions to help you realize key facts about your situation. With these facts in mind, you can evaluate and select a patient lift solution. Where do you need to use this lift? If in a home: What rooms within the home? In a bathroom? In a bedroom? In a family room? Between multiple rooms? What type of flooring do you have? Carpet? Is there space available to operate a rolling patient lift and space to store it when not in use? Evaluate all potential tight areas. Does the bed have clearance under it for the legs of a rolling lift if necessary? What do you know about your ceiling construction? Spacing and mterial of joists? Which direction do they run in your ceiling? If in a facility: In a ward? Between multiple rooms? What is the current injury rate for caregivers? What is the patient's weight and height? What is their condition -- things that might relate to lifting them? Do they need head support? Do they have sensitive skin? Any restrictions to bending? What kinds of applications will you want? Bathing? Toileting? Transferring? Re-positioning? Do you ever need to lower patient to or lift patient from the floor for therapy or after a fall? Is the patient always assisted? How strong are they? (Do we have a 120 pound caregiver caring for a 200 pound patient?) Powered lifts can allow anyone to safely move their patient. All caregivers will need to become familiar with the operation of the new lift. What types of lift movements does patient need to be able to accomplish? Bed to Chair or Toilet or Tub or Floor and back? Chair to Bed or Toilet or Tub or Floor and back? To/from floor for therapy or in case patient has fallen? Re-positioning the patient in their chair or bed? Rolling or otherwise re-positioning the patient in bed? Want something portable to use to visit family members or travel using hotels? A patient lift in your home may be the factor that allows the disabled individual to stay at home instead of being placed in a facility. A patient lift can help the caregiver provide care for their loved one, without strain and injury. Let patients feel like less of a burden on their caregivers. A patient lift will improve the patient's quality of life, but we know that the cost of a lift is a deciding issue. Patient lift costs should be viewed in light of the costs that the lift can avoid or offset. Patients can be cared for at home instead of institutionalized. Caregivers can avoid costly and painful injuries. Healthcare, government support and insurance policies are in a constant state of flux. We/you cannot know, without formally inquiring, whether your insurance plan, life-care plan or other funding source will cover part or all of a patient lift. We will mention that Medicare and most insurance companies do not cover lifts other than the simplest rolling lift. But, there are some insurance organizations, nonprofits and other funding sources that do assist with patient lifts. The rationale behind insurance and other funding groups covering patient lifts, is that patients are more able to accomplish their own activities of daily living when they are able to be transferred easily. If the patient's family member is able to accomplish transfers with the assistance of a patient lift, costly attendants and other home care can be avoided. Even if an attendant is used, patient care is more satisfying for the patient and less costly for the insurance company or funding source, when the patient is able to stay home. Insurance companies and funding sources know that, when compared to the cost of institutional care, a patient lift is an inexpensive option. We accept most major credit cards, PayPal and PayPal Credit, which all provide a type of financing. Please see the "Financing Methods" section of our "Purchasing Methods" page for more information.